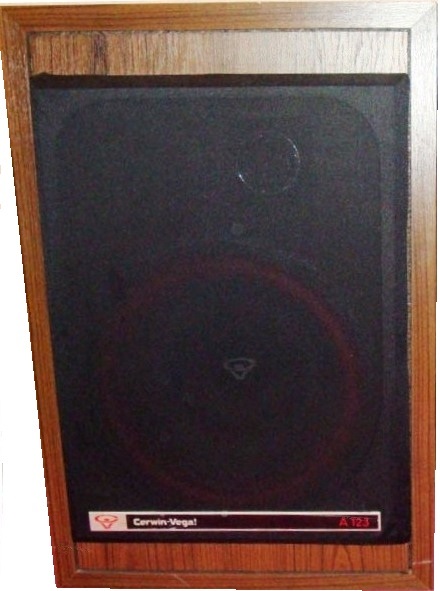 The Cerwin Vega A123 or A-123 are rather rare 3-way speakers. They had been sold during the late 1970ies and early 1980ies and are similar to the A-10, U-103 and U-123, as all share the same tweeter models. The A123 is one of the first lines of Cerwin Vega´s home speaker series after the success of its Model 24 and 26 several years earlier. They are part of the “HED” = High Efficiency Design series, promising loud and clear performance. The A123 is a small, fairly rare, but affordable speaker and a great choice for an inexpensive HiFi system. Each A123 weighs about 50 lbs., made from particle board, covered with real walnut veneer. Their size is approximately H 25” W 17” D 12”. Each speaker contains a 12 inch woofer, with CV´s typical red woofer foam, a 6 inch midrange and a horn (DHorm) tweeter. (Horn tweeters have the advantage to reduce dispersion and increase tweeter efficiency). CV´s A123 horn tweeter is covered with a protective cover, so it might not be visible. The Cerwin Vega A-123 is definitely able to be clearer and louder than many of nowadays´ home speaker systems. They are generally great for rock music, as the woofer and midrange speaker are very punchy. However, it is very sensitive to the Amp and other components that are used with it. If you are looking to buy a pair of these vintage speakers, you can be fairly lucky and get them for around $40, probably with rotten foam surrounds. Be sure to test or check the midrange speakers, as it can be difficult to repair them. If the mids are ok, and you really just have to refoam the speakers, it is a great bargain! If you don´t like the hassle of refoaming woofers or own a pair of A-123´s and want to sell it in good condition, you can ask for $100. Ebay and craigslsist occasionally lists these speakers for about $150, but that does not mean that they sell for that price. It can be fairly difficult to differentiate between the A123 and some other Cerwin Vega speakers of the late 70ies, as some look nearly identical. Best is to measure the depth of the cabinet side walls, which should be 25 mm (1 inch). The most similar CV U-123 has only 19mm thick cabinet walls. As the side walls of both cabinets stand out to the front, this should be the easiest way to identify the speaker.